Old sofa. Anyone want it? 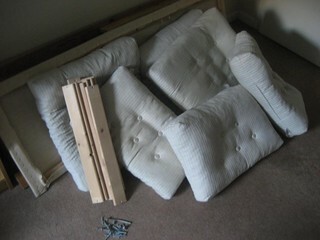 Does anyone (who is able to collect it from London N19) want our crappy old sofa? Update: Due to the power of freecycle, the sofa is no longer available! Someone came round and collected it off me. The good news: Free sofa! It’s a not a good sofa. It’s a very low-end cheap IKEA sofa. It’s old. The cushions aren’t horribly stained, but they’re not exactly white anymore either.